With the New Orleans Pelicans down to a three-man bench that forced coach Alvin Gentry to scrap his normal rotations, Clark earned a rare start and played nearly 36 minutes in a fast-paced game that left him exhausted at the end. 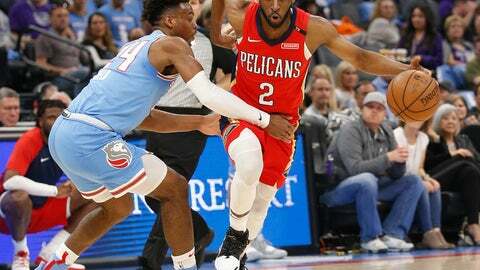 Clark had 31 points, Elfrid Payton scored 12 of his 25 in the final 3½ minutes and New Orleans beat the Sacramento Kings 133-129 on Sunday night. New Orleans (33-48) was short-handed after Julius Randle and Stanley Johnson were ruled out before the game. The Pelicans have already been playing long stretches without Jrue Holiday — out since undergoing shoulder surgery in March — and Anthony Davis (back spasms). With little help coming off the bench, New Orleans’ starters were forced to pick up the slack. New Orleans equaled a franchise record with 19 3-pointers. It’s the third time this season the Pelicans have made 19 3s. The Pelicans prevented the Kings from celebrating their first 40-win season at home since 2005-06. Sacramento (39-42) can still reach 40 wins by beating Portland on the road Wednesday. Pelicans: With Randle getting the night off for rest, Christian Wood started in his place. Kings: Bagley’s double-double was his 19th this season. … Joerger picked up a technical foul at the end of the third, his eighth this season. … Sacramento closed the third quarter on a 22-6 run, not long after allowing the Pelicans to go on a 20-5 spurt.